There are quite a few manufacturers that released some innovative handguns this year, as well as some handguns that have stuck around as all time favorites. Handguns are arguably our favorite guns to shoot, so we’re excited that we get to go through the best 9mm handguns of this year. We’ll go through a few different styles of handguns as well, from carry guns to service guns. We’re going to just start out with our opinion of the best all around 9mm handgun in 2018, the Smith and Wesson M&P M2.0. The M2.0 model released back in early 2017 and I finally got my hands on one early this year. I have actually been carrying this gun every day, and I am a big fan. The M2.0 includes quite a few upgrades from the first generation of polymer handguns. The M&P series has been widely popular with law enforcement, self-defenders, and other shooters across the country for a while. Upgrades for the M2.0 version include a much better grip texture, which is very aggressive and makes holding onto and controlling the handgun much easier. The trigger has also been changed and upgraded. It is the same style of trigger, but the trigger pull and reset are both phenomenally better than the original M&P’s triggers. The M2.0 also features a more solid frame, with steel reinforcing the polymer underneath. This aids in bringing the amount of felt recoil down. The M2.0, much like the original M&P’s, has an awesome grip angle. The way that your hands fall on the gun in a proper grip make acquiring the sights a breeze. It is very comfortable gun to shoot. Another plus for the M2.0 is that it is made here in the United States of America. This is something that may influence your decision to buy this great series of handguns. They are made in Springfield, Massachusetts my Americans like yourself. Other features of the M2.0 include a melonite finish, either in black or flat dark earth. They have the option for an external safety if that is something that you desire. Additional palm swells are included with each M2.0 to find the perfect grip for you and your hands, as well as ambidextrous slide lock/release levers, the ability to change which side the magazine release is on, and if you choose a model with a safety on it, that will be ambidextrous as well. The full size M2.0 has a 4.25 inch barrel and a 17+1 round capacity from the factory. Other options include a 5 inch barrel (most commonly seen in the flat dark earth finish). As a side note, the M2.0 series also includes the M2.0 Compact, with a newly released 3.6 inch or the standard 4 inch barrel and 15+1 round capacity as well as the M2.0 Shield, which comes with a 3.1 inch barrel and an 8+1 capacity. The M2.0 is a fantastic handgun, and in our opinion, the best 9mm handgun for 2018. It is easy to carry, easy to shoot, and a great way to go if you’re looking for options on the same platform, all made in America! The Sig Sauer P365 is truly groundbreaking in the realm of concealed carry pistols. Sig Sauer is a great manufacturer to buy from, and they have a wide range of options. The P365 is definitely an innovative concealed carry option. There are a lot of guns that are easier to conceal for most people featuring smaller frames as well as shorter barrel and slide lengths. The Smith and Wesson Shield as mentioned above is one of those options, and another gun in the same realm that is extremely popular is the Glock 43. The Sig P365 has something that these other guns do not have: the P365 has a 10+1 round capacity. It can even be bumped up to 12+1 with a magazine with an extended base plate included from the factory. This capacity in a sub-compact handgun is unheard of up to this point in time. The Shield and Glock 43 feature single-stack magazines, while the P365 includes some kind of mix between the single-stack and a double stack magazine, fitting 10 or 12 rounds into a handgun the same size or smaller than its competitors out on the market. The P365 feels great in the hand. It is small, but it shoots incredibly well. It comes from the factory with Sig night sights, an awesome feature. The trigger, the same as most Sig pistols, is a great one. Once I was able to handle one, I was shocked. I had heard that they were small, but I was still amazed that they were able to get the capacity that they did out of such a small package. To me, it felt smaller than the Shield, but has a larger capacity.For those looking for a fantastic carry gun, the Sig P365 would be an amazing option. It is truly unique on today’s market, and definitely one of 2018’s best 9mm handguns. The Glock 19X fills another spot here on our top 5, coming in at #3. The 19X introduced to the public in January of 2018. The 19X was Glock’s contribution to the decision to change handguns by the Army. The 19X is a crossover of two of the arguably most popular Glock handguns, the Glock 19 and the Glock 17. The Glock 19X features a 4 inch slide on a full size (Glock 19) frame.It features the Gen5 Glock features, including a grip without the famous Glock finger grooves. It comes in the Coyote color, which, like the flat dark earth, is becoming increasingly popular. The 19X comes from the factory with one standard 17 round magazine as well as two extended 19 round magazines, giving you the ability to have a 19+1 capacity. Glock pistols have been forever-known for their rugged durability, even under terrible circumstances. They will run despite just about anything you can try to do to them. The 19X is no exception. For your info as well, the pistols that combine to make the 19X are both great pistols as well. The Glock 19 is arguably one of the most popular carry guns and the Glock 17 is a great full-size pistol. If you are looking for a gun from one of the world’s top manufacturers that you can shoot for fun, carry, or put through the ringer in a gun-carrying occupation, the Glock 19X is a great option. The Hudson H9 is another fairly innovative product to enter the handgun realm recently. Released around mid last year, the H9 has been fairly popular in the handgun world. It is rather clever what Hudson did with this particular model. The H9 is different from most striker-fired semi-automatic handguns (all of the guns in this article fit this description). The H9 has a lot of 1911 style features, without losing the features that most know and love about the striker-fired platform. For a start, one of the most notable features is that the H9 has a very low bore-axis compared to most other handguns, meaning that when gripping the gun properly, the barrel of the gun is lower and closer to in-line with your hand while shooting. This makes managing recoil and getting follow-up shots on target very easy. The H9 also features a 1911 style trigger, meaning that there is very little take-up (travel of your finger on the trigger before it reaches the point that a shot is made) and it has a crisp take up and reset. 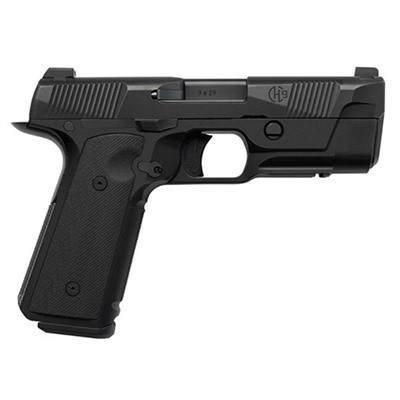 The H9 has a polymer frame, which saves on weight compared to the standard 1911 platform. It comes from the factory with a 4.3 inch barrel and three 15 round magazines, giving the H9 a 15+1 capacity. You will pay notably more for the Hudson, but lots of people are buying this handgun, and for good reason. Combining John Browning’s genius design and features of the 1911 with the likes of standard semi-automatic handguns today into a great package, Hudson hit a home run with their H9 model. The CZ P-10 C is a great addition to this lineup of best 9mm pistols for this year, and it’s one you may not have thought about or even heard of. It is fairly new to the market, having been released in 2017. The P-10 makes our list because we think that people are realizing the potential this gun has. It is very comparable to a Glock 19 or a Smith and Wesson M2.0 Compact, having roughly the same features as both. The P-10 has a barrel length of 4 inches. This makes it a very viable option for concealed carry if that is what you are looking for. It has a polymer frame and a steel slide, just like its competitors from Glock and S&W. This gun has reached the gun community as a newcomer that can hold its own. The trigger is a lot like a Glock trigger and it has a 4 pound pull, making both shots and follow-up shots easy. The P-10 has a 15+1 capacity. It also uses the same magazines as another CZ firearm, the P07, which makes for nice interchangeability between the two firearms if you have both. The price point on the CZ P-10 C is quite affordable, which may be helpful. The P-10 C can definitely hold its own next to many of the guns we have discussed here.If you’re looking for a recently developed handgun at a fairly budget-friendly price, the P-10 C would be a great option for concealed carry, home defense, or even just target shooting. Final Thoughts: What is the Best 9mm Pistol for you? We firmly believe in the end user trying out each product to find what fits his or her needs and wants. This is important for handguns. The 9mm pistols we have discussed here fit into different categories and could all serve unique purposes. Try ‘em all out. We think the M&P M2.0 from Smith and Wesson is the best 9mm handgun to buy. 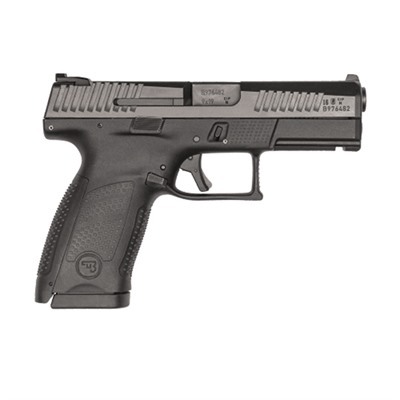 It has tons of options within the M2.0 platform, and is an all around great 9mm pistol. I have enjoyed carrying and shooting mine, and I suggest you go out and try one for yourself! Be safe, and get out and shoot.